Egg Roll in a skillet! 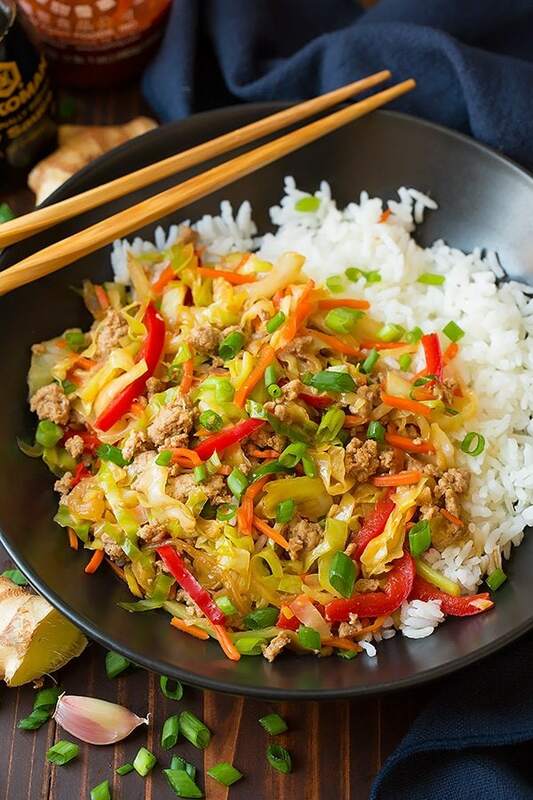 A quick and easy cabbage and ground turkey based stir fry that’s perfectly hearty and deliciously flavorful! A healthier alternative to egg rolls (without the fried wonton wrappers) yet it’s still just as tasty! Less work and no oily mess here either. Easier Way to do Egg Rolls! 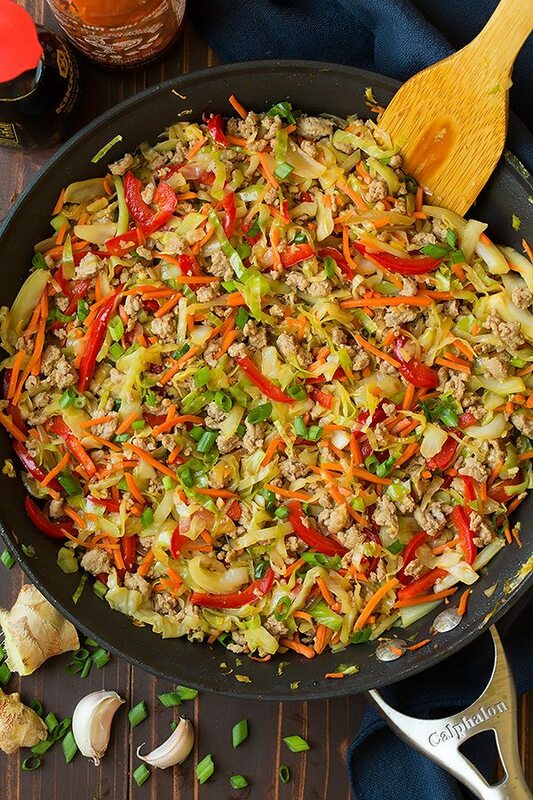 I’ve already made this delicious Egg Roll Skillet twice this week and I know it’s a weeknight recipe we’ll want again and again! It can be made in 30 minutes or less (make the most of your time and chop veggies while the turkey is cooking) and I love that it’s a dinner everyone can agree on. I mean how could it not be it’s basically an egg roll meets stir-fry? 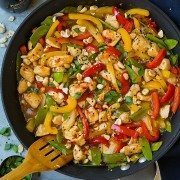 Can I Use Ground Chicken or Pork? 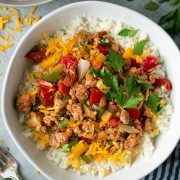 I tried this once with turkey and once with pork and actually preferred the turkey but if ground pork is what you have on hand feel free to use that instead, ground chicken will work great too! I like this served with rice (brown or white) but it’s delicious all on it’s own as well. In my opinion though it needs a fair amount of sriracha squeezed over the top – that is if you love lots of heat like I do :). Skip the take out this week an try this instead! 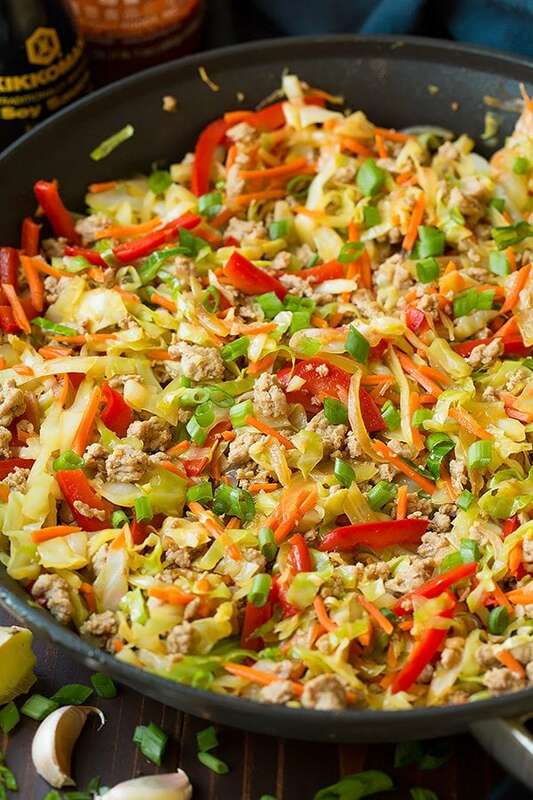 A quick and easy cabbage and ground turkey based stir fry that's perfectly hearty and deliciously flavorful! A healthier alternative to egg rolls without the fried wonton wrappers yet it's still just as tasty! In a small mixing bowl whisk together 1 Tbsp of the soy sauce with cornstarch until well blended. Mix in remaining 2 Tbsp soy sauce, chicken broth, sesame oil, brown sugar and sriracha, set aside. Heat 1 Tbsp olive oil in a 12-inch (deep) non-stick skillet over medium-high heat. Add half of the ginger and half of the garlic and saute 20 seconds. Add turkey and season with just a pinch of salt. Cook, while breaking up turkey and tossing occasionally, until turkey has cooked through. Drain and transfer turkey to a sheet of foil, wrap to keep warm. Heat remaining 1 Tbsp oil in same skillet over medium-high heat. Add onions and saute until they have nearly softened, about 4 minutes. Add in bell pepper and remaining half of the ginger and garlic and saute 1 minute longer. Toss in cabbage and carrots then whisk soy sauce mixture once more and pour over cabbage. Allow to cook, tossing frequently until cabbage is tender, about 4 - 5 minutes. Toss in cooked turkey. Taste and add in a little more soy sauce if needed. 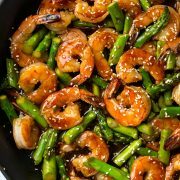 Serve warm topped with green onions and more sriracha if desired. *Instead of chopping the cabbage yourself you could replace the shredded cabbage and matchstick carrots with equal amounts of coleslaw mix.